Located in Northwest China, Shaanxi was one of the important birthplaces of Chinese civilization. 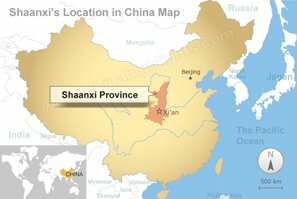 Shaanxi has an area of 205,800 square kilometers with a population of over 38 million. It takes 2½ hours to fly from Shaanxi to Beijing, and 1 hour and 50 minutes to fly to Shanghai. There are many famous attractions in Shaanxi, including the Terracotta Army, Huaqing Hot Spring, the Mausoleum of the First Qin Emperor, and Xi&apos;an City Wall. Most of these attractions are concentrated in Xi&apos;an.